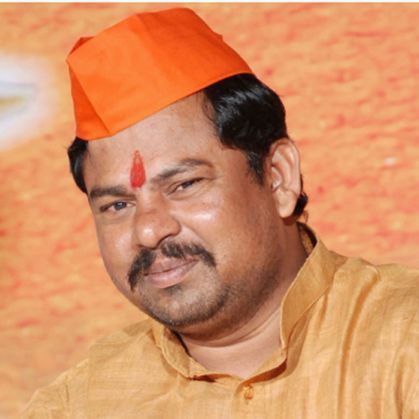 A BJP MLA in Telangana has sparked off a fresh controversy with his remarks on cow protection on a day when Parliament was debating 'rising intolerance' in the country under the Narendra Modi government. "We are ready to kill or get killed to protect cows. We have the right to stop cow killers. This festival is a political conspiracy for votes." His comments are matched by the posters on his facebook page in which Singh is seen wielding a sword while calling out people join his cow protection drive. He also attacked the Telangana government for allegedly backing cow slaughter houses. He further stated even if he didn't get support from the BJP in his protests against the beef party, he would go alone as "he is a Hindu first". 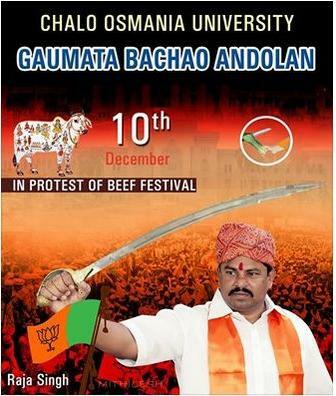 The BJP MLA has demanded that if this event is permitted, another one to worship the cow should also be allowed. A memorandum has been submitted to the university Vice -Chancellor, arguing that if "beef festival" is permitted, an event to worship the cow should also be allowed to be held in the campus, Singh said. The festival is being planned on December 10, coinciding with International Human Rights Day, as a means to "save democratic principles" in the wake of alleged attempts to curb dietary habits of certain groups, Shankar, one of the organisers of the proposed event, said. The university has a history of reflecting on "anti- democratic and hegemonistic" incidents in the world, said Shankar, who claimed to be a member of the All India Students Federation (AISF), affiliated to Communist Party of India. Leaders of different political parties are being invited for the festival, which he said, is not intended to target anybody. Singh's comments come at a time when the BJP government at the Centre is battling charges of failing to rein in the "fringe elements" in its party. Rajnath Singh, while concluding the intolerance debate had said that ministers and BJP leaders "should be careful in giving statements" and "we should speak after thinking".